‘Tom and I have been through such a journey already, and I feel as though it’s just the beginning. I've been fortunate enough to build a very dear friendship with Tom over the past year, shortly after he returned from his apprenticeship with Ervin Somogyi. Tom and I discovered each other on Instagram (very 21st century). After discovering a mutual respect for each other’s craft, we arranged to meet so that I could try some of his instruments and record some videos together. The thing I love most about playing acoustic guitar is the sheer expanse of tonal possibility at your fingertips. When I tried Tom’s guitars for the first time, I discovered that they were the most incredibly responsive platform for me to tease out every tonal and dynamic detail I could think of. But more than that - they suggested other possibilities that hadn't even crossed my mind - and that was exciting. All of Tom's guitars I played that day allowed me to be as expressive as I wanted to be, which was their unifying factor, whilst each was able to uniquely suggest different paths to follow. Wrap that up with some of the most stunning visual detailing, effortless playing feel, and outstanding design ethic - and I realised he was doing something very special indeed. From our first meeting, discussions opened about a collaborative project to unite our synergy as player and maker. And so he invited me to the Holy Grail Guitar Show in Berlin to showcase a Model S and a Model M that would eventually go to a client in California. I fell in love with the Model S from the moment I opened the case; and then I played it, and it was pretty much decided that this was the Model we were going to collaborate on. At the Holy Grail Guitar Show in Berlin, recording on the Model S.
A fair few phone calls later, we arrange many emails, multiple recording sessions, visits to Tom's workshop, another guitar show in Vancouver and a house concert upon delivery for the lucky new owner of the Models S and L (see showreel below), a few too many drams of whisky, and we found ourselves putting this wonderful plan in motion - collaborating on our first ever signature guitar. What an honour it is. And it's certainly true to say Tom's guitars are not just some of the finest I've ever played, but that his Model S is the most "me" guitar I've ever come across. As I had spent so much time with Tom, playing his guitars and reacting to all the different options, he was in the unique position of knowing my playing and composition style inside out. The perfect partnership for a signature instrument. Showreel performed on the Model S and the Model L at a house concert for the new owner in California. Other than the response and feel of Tom's guitars, the other thing that really connected with me was his approach to design and material. This is particularly evident in his use of copper for his rosettes. Sometimes etched, sometimes patinated, but always entirely considered and appropriate. I studied design at university, and as a result felt the potential of etched copper was perfect to revisit some of those skills I gained to produce my own "signature" rosette. It also helps that Tom and I share a love for the design movements of the past; Bauhaus, Memphis and the like, so were very much on the same wave-length from the start. Cue a considerable amount of time on Adobe Illustrator and Photoshop... 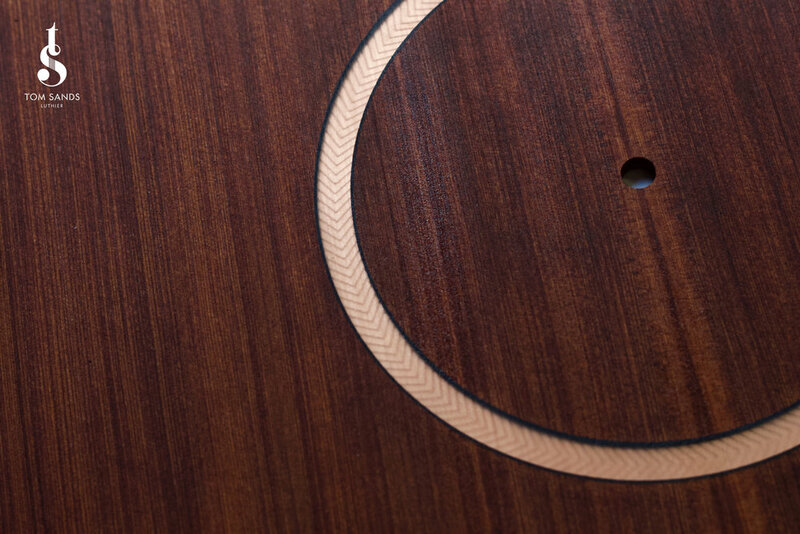 I wanted to give a nod to my classical guitar upbringing with a radial pattern, but as understated as possible to not detract from the natural beauty of the copper. Tom took some nods from the old Martin D-28's, and my love of herringbone patterns all went into the pot. I believe it was Miles Davis who uttered the immortal: "It's not the notes you play, it's the notes you don't play" and in this instance it was definitely a case of "It's not the lines you etch, it's the lines you don't etch". We tried a fair few iterations, and ended up with something we were both over-the-moon with. A simple, contemporary radial design with a nod to a contemporary take on herringbone and classical rosettes. The etched pattern will be quoted in the headstock wedge and on the back as well. Our designs etched into copper. The inlayed rosette on our Signature Model. First impressions when it was complete? Well, as I walked into the workshop with the guitar proudly placed atop Tom's workbench, its sheer beauty was the first thing to hit me. 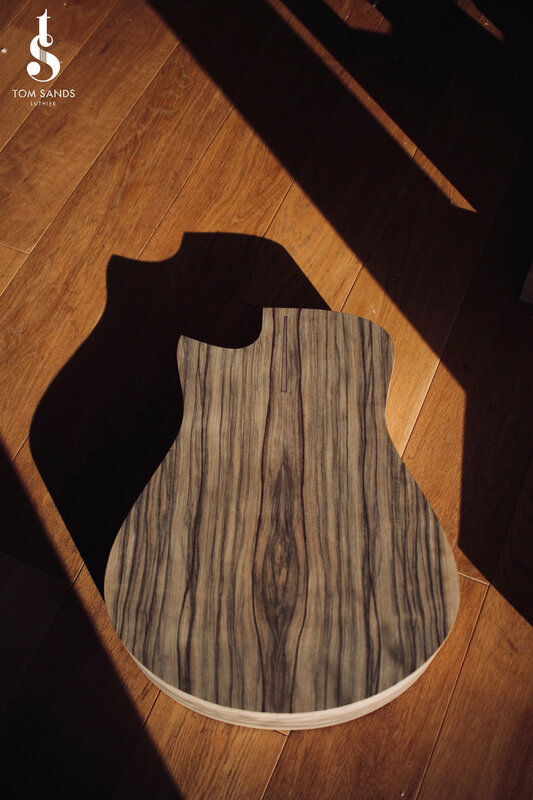 The redwood with the copper rosettes and detailing, how it catches the light, and then of course the black limba. Just stunning. Up close, the detailing is just next-level. Seeing the material combinations in person, particularly the redwood against the copper, blew me away. Then, of course, I couldn't stop playing the thing! I kept calling Tom over to say: "Oh man, listen to this"... "oh and how about THIS". Tonally, the plan came together beautifully. 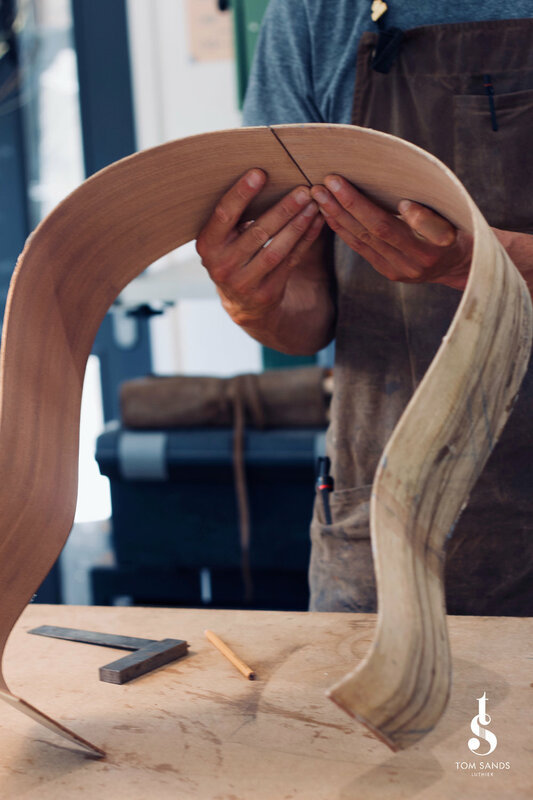 The essence of the first Model S I fell in love with was very much there, the feel, the comfort, the fizzy excited-to-make-music feeling, but the Redwood has had an effect to round off the trebles beautifully and the Black Limba gives it real punch and clarities across the board. The solidity of the Wenge neck gives it a weight that I love, but feels appropriately balanced and entirely effortless to play. Amazingly, the mids have really taken off as well, not something I remembered but I was effortlessly voicing chords with mid-string melodies which just rung out perfectly, and sustained for days. And then there were the recordings. We spent a good amount of time in some beautiful locations at a wonderful country estate called Broughton Hall doing precisely that! When it's all been put together of course I'll get sharing the results. One thing I'll remember is the first notes I played in their enormous and stunningly beautiful conservatory. The sound amongst the natural reverb was something else, and as the light shone through, and the birds tweeted in the background - I thought to myself.... what am incredibly lucky chap I am to be here with dear friends playing this wonderful instrument. Humbling in the true sense of that word. 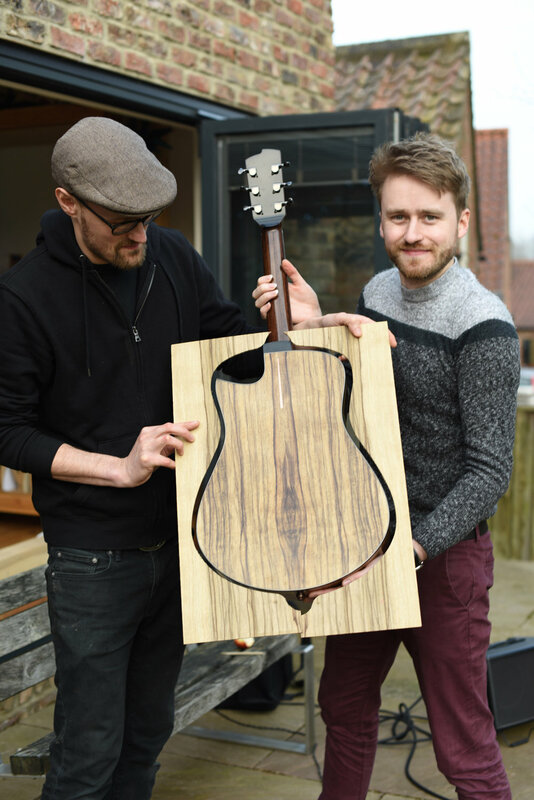 Here are the finished studio shots of the guitar - which I named ‘Jupiter’ according to the magnificent swirling gas-cloud like Black Limba on the sides.